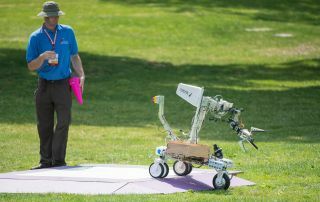 A robot built by the team Formicarum rolls off its starting platform during a level one rerun at NASA's 2015 Sample Return Robot Challenge on Friday, June 12, at the Worcester Polytechnic Institute (WPI) in Worcester, Mass. Sixteen teams are competing for a $1.5 million NASA prize purse. Robot-toting teams faced off in a NASA contest this week to see which automaton has the right stuff for working on Mars or other locations in the solar system. The fourth NASA Sample Return Robot Challenge, which ends today (June 13), offers a grand prize of $1.5 million to the winning team able to demonstrate robots that can collect geologic samples without any human help at all. "With missions to other planets and deeper space in our sights, it is increasingly valuable and necessary to see these technologies through," Sam Ortega, program manager for Centennial Challenges at NASA's Marshall Space Flight Center in Huntsville, Alabama, said in a statement. "Robots are our pioneers, and solving this challenge will be a breakthrough for future space exploration." There are two levels of competition available this year. In 2013 and 2014, the winners of Level 1 – Team Survey of Los Angeles in 2013 and the West Virginia Mountaineers of Morgantown – each received $5,000. These teams can each compete at Level 2 this year.